This article demonstrates how to execute INSERT Query from python to add a new row to the MySQL database table. I’ve written multiple examples in Python that shows how to INSERT rows into MySQL table. This article is part of our series Python MySQL Tutorial. After this article, solve our Free Python Database Exercise to practice and master the Database skills in Python. Also, Solve our Free Python Database programming Quiz to test your Python database concepts. Insert single and multiple rows into MySQL table. Insert Integer, string, float, double, and datetime variable into a MySQL table. 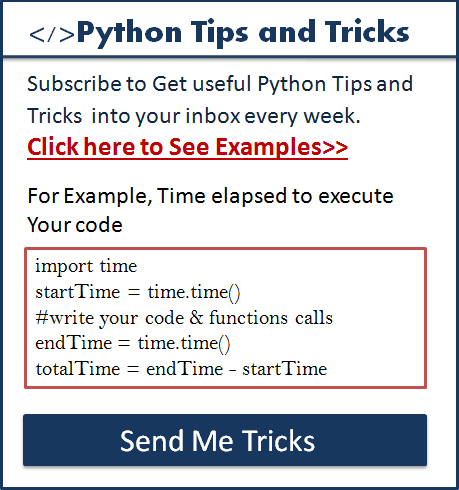 Use a parameterized query to insert Python variables and dynamic data into a table. I have created table “python_users” in MySQL server to insert records in it. See its column structure in the following image. 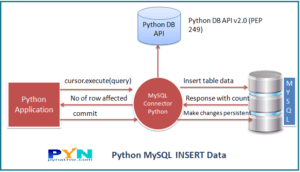 Note: We are using MySQL Connector Python module to insert data into MySQL table. Install MySQL Connector Python using pip. First, Establish a MySQL database connection in Python. Then, Define the SQL INSERT Query (here you need to know the table’s column details). Execute the INSERT query using the cursor.execute()and get a number of rows affected. After successful execution of a query, Don’t forget to commit your changes to the database. Close the MySQL database connection. At last, verify the result by selecting data from MySQL table. (`id`, `name`, `birth_date`, `age`) VALUES (1,'Scott','2018-04-11', 26)"""
At first, import mysql.connector imports MySQL Connector Python module in your program so you can use this modules API to connect MySQL database. Next, we prepared SQL INSERT query to insert a row into a table. in the insert query, we mentioned column names and their values to insert in a table. Next, Using a connection.cursor method we created a cursor object, This method creates a new MySQLCursor object. We are using the cursor.execute() method of a cursor object to execute the operation stored in the INSERT query. Also, this method returns the number of rows affected. At last, we are closing cursor and connection object inside the finally block once we complete insert operation. It is always good practice to close connection to avoid database issues. Refer to How to fetch rows from MySQL table using a select query in Python to check the data that you just inserted. Note: We also used commit() and rollback() function. let’s understand this in brief. commit() to make changes persistent in the database. rollback() rollback or reverse the changes if any database error occurred. Sometimes you need to insert a python variable value into a table’s column. For example, in the user signup form user enter his/her details. You can take those values in Python variables and insert into a table. We can insert Python variable into the table using the prepared statement and parameterized query. Using a parameterized query we can pass python variables as a query parameter in which placeholders (%s) used for parameters. You can read more on What is a Parameterized Query and its performance benefits. Let see how to do this with an example program. (`id`, `name`, `birth_date`, `age`) VALUES (%s,%s,%s,%s)"""
What if you want to insert multiple rows into the table in single insert query from python application. You can insert multiple rows into MySQL table. You can use the cursor’s executemany() function to insert multiple records into a table. Note:- in the previous example we have used execute () method of cursor object to insert a single record. The syntax of the executemany() method. This method prepares a database operation (i.e., query or command) and executes it against all parameter sequences in the sequence “seq_of_params” argument. You need to include lists of tuples in “seq_of_params” argument along with insert query. Each tuple inside the list contains a single row that you want to insert. So you can add as much as rows in the list and pass a list to cursor.executemany() function along with insert query. Here we are using the prepared statement (parameterized query) to insert multiple rows into a table. why use a prepared statement? Because to repeatedly execute the same statement with different data we use the prepared statement. And in “seq_of_params” we are passing below List. Let’s demonstrate this with an example. Let’s understand the above program in detail: –. After a successful database connection, we prepared a list of rows to insert into the table. SQL INSERT statement contains the parameterized query which uses the placeholder (%s) for each column value. connection.cursor(prepared=True) allows the cursor to execute the prepared statement. Next, Using cursor.executemany(sql_insert_query, records_to_insert)we are inserting multiple rows (from a List) into the table. Using cursor.rowcount method we can find the number of records inserted. Finally, we are committing our changes to the database. You can refer to our article on how to fetch data from MySQL table to verify your result. For example, you have a date column in a MySQL table, and you want to insert a datetime.datetime() object into this column. Then how to prepare an insert query to add datetime into a table column. Let’s see this with an example. You can get output like this after execution of the above code. 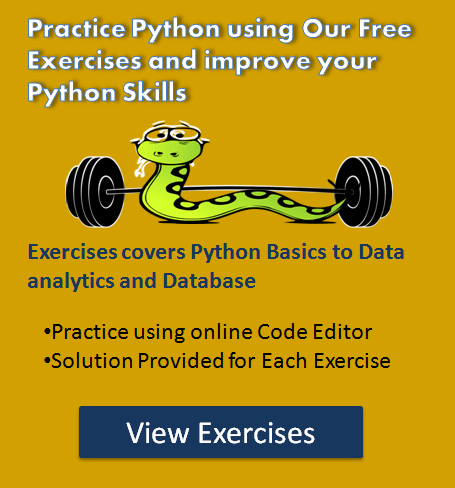 Solve the Free Python Database Exercise project to Practice and master the Python Database operations using MySQL. the second and third with the parameters throws an exception. i think it has to do with prepared=True. I am getting error: “UnboundLocalError: local variable ‘cursor’ referenced before assignment” for the second example, of inserting data using python variables. Hey Isha. create a cursor using connection first then use it.